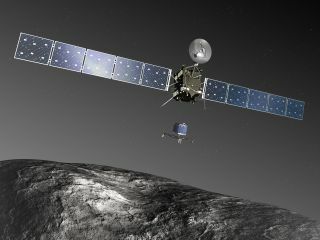 In the chilly reaches of deep space, the unmanned Rosetta probe will soon awaken from a years-long hibernation for a 2014 comet rendezvous, and the European scientists want you to help wake the slumbering spacecraft. The European Space Agency is asking comet fans around the world to create a special video message to rouse the Rosetta spacecraft under the new 'Wake Up Rosetta' campaign. Launched in 2004, Rosetta has traveled around the sun five times, gathering energy from the orbits of Earth and Mars to help slingshot into deep space. In August 2014, the craft will rendezvous with comet 67P/Churyumov-Gerasimenko and follow it for a year, observing the frozen dustball as it makes its closest approach to the sun. After observing two small asteroids, Rosetta entered a 31-month hibernation in June 2011 for the longest, coldest part of its trip. Following its wakeup, it will prepare for a deep-space maneuver, ultimately arriving at the comet in August 2014, just outside the orbit of Jupiter. Three months later, Rosetta will drop its Philae lander onto the comet's surface, where it will study how 67P/Churyumov-Gerasimenko changes as it travels closer to the sun. The contest, which started 10 December, will run until 17:30 GMT (18:30 CET) on January 20. Rosetta itself will be waking up at 10:00 GMT (11:00 CET) that same day. Winners will be announced on January 24. Contestants can post their videos to the ESA's Facebook page, where other users can vote. The top ten videos will be transmitted to Rosetta using one of the ESA's deep-space tracking stations. A gift bag of selected ESA-branded souvenirs will be awarded to each eligible participant submitting one of the top ten videos. Furthermore, two of the authors from one of the top ten will be invited to Rosetta's control center in Darmstadt, Germany in November 2014 for the VIP event celebrating the first-ever landing on a comet. People around the world are also invited to participate in the Wake Up Rosetta campaign on Twitter, by following and shouting #WakeUpRosettta at @ESA_Rosetta. Shouts will be welcome at any time, but particularly during the Wake Up Rosetta event on Jan. 20 between 10:00 and 17:30 GMT (5 a.m. and 12:30 p.m. EST).